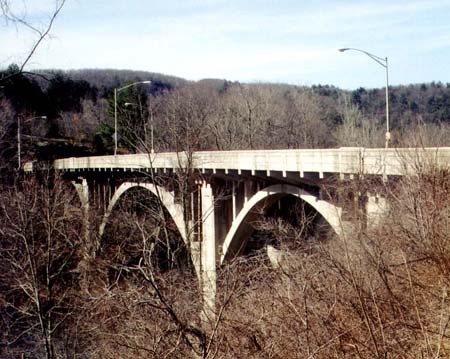 Built as part of the State Highway Department's initiative to improve "trunk line" bridges, the 1928 Reynolds Bridge in Thomaston solved several inadequacies with the previous bridge and was hailed for its grace and beauty. The earlier bridge was old, narrow, and had a sharp curve and an at-grade railway crossing at each end. Because it was located closer to the river, it also was prone to flood damage during times of high water. By raising the level of the roadway to cross both the river and the railway tracks and making the crossing more skewed, the new bridge better served the needs of traffic on Waterbury Road, which prior to Route 8 was the major north-south route serving the upper Naugatuck Valley. At the time it was designed, the river span was the state’s longest arch yet attempted. The bridge features three spans of open-spandrel concrete arches and eight concrete-girder approach spans. 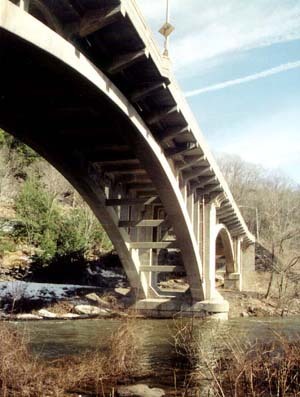 Each of the arches consists of two ribs connected by struts, with columns rising to support cross beams for the roadway. The middle arch over the river is the longest at 169'; the flanking arches are each 97' long. The east arch crosses the single track of the Naugatuck Railroad (though the arch was designed wide enough for two tracks), and the west arch formerly crossed the street railway tracks that connected Waterbury and Thomaston. The bridge’s roadway is 50' wide and is cantilevered out over the arch ribs by extensions of the floor beams. An unusual feature of the bridge is that the springing point for the side arches is higher than that of the river arch, necessitating substantial piers to resist the offset thrusts. Decorative features include arched openings between the columns and railings with recessed panels. Planning for this bridge was delayed until 1925 because the first priority of the Department was to improve the busier crossings along the Connecticut shore and in the lower Naugatuck Valley. Reynolds Bridge was one of eight outstanding bridge projects enumerated in the Department’s 1935 history of the state’s highway system.